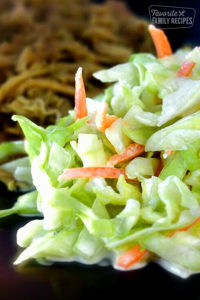 Chop up the cabbage and carrots into fine pieces. In a large bowl, combine sugar, salt, pepper, milk, mayonnaise, buttermilk, vinegar, lemon juice and mustard, and whisk until smooth. Add the cabbage and carrots. Mix well. Cover and refrigerate overnight. Drain excess liquid and stir well before serving.